Roof tiles - 241 Lincoln Pkwy. Terra cotta - baked clay tiles of any shape (in molds) often fired with a colored glaze. Terra cotta is a hard, semifired, waterproof ceramic clay used in pottery and building construction. Used mainly for wall covering and ornamentation as it can be fired in molds. Oftentimes, white or colored glaze is applied on the face of the brick. Terra cotta is a form of hard-baked pottery, widely used in the decorative arts, especially as an architectural material, either in its natural red-brown color, or painted, or with a baked glaze. In modern times terra-cotta has been used in the Victorian Gothic Revival , as well as other styles, and has received widespread application in the United States as an exterior covering for the skeleton steel structure. 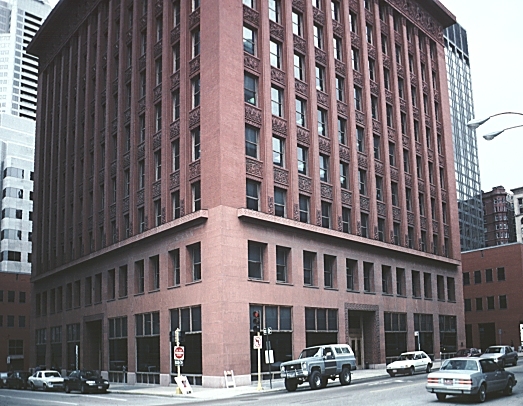 It was used with consummate skill by Louis Sullivan on many of his buildings. 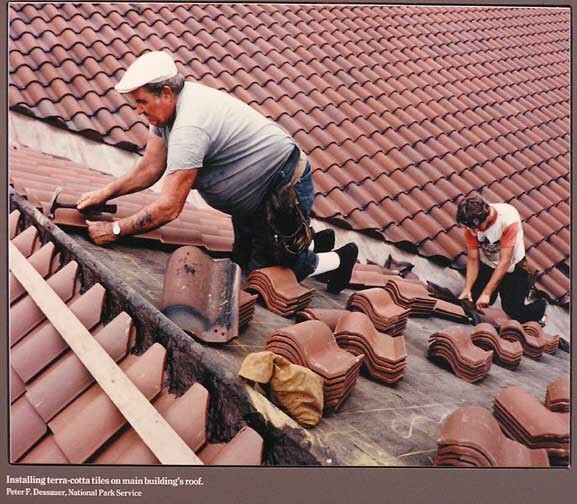 In the 21st century, the Boston Valley Terra Cotta Company is one of only two American companies (the other in in California) producing architectural terra cotta. Terra cotta has often been molded into the forms of the classical and other styles, with textures closely simulating various kinds of stone. However, it has been most successfully used not imitatively but on its own merits as a lightweight, nonbearing material, perfectly adapted to the task of sheathing a steel frame. Hollow blocks or tile of rough terra-cotta are used extensively as a structural material for walls and partitions, for floor arches, and for fireproofing. In modern practice terra-cotta is manufactured from carefully selected clays, which combined with water and vitrifying ingredients, are put through a pug mill (mixer) or other device to reduce the mass to homogeneity. In cakes of convenient size the clay passes to the molding room. Individual pieces are modeled by hand; in the case of repetitive pieces, the clay is pressed into plaster molds to form a shell. The molded pieces are finished by hand and then are ready for baking in a kiln or reverberatory furnace. Terra cotta, from the Latin terra cocta or "cooked earth," is made from a mixture of fine-grained clays containing silica, alumina, and some alkaline matter that vitrify when fired in a kiln. Differing from brick in its finer quality it is a durable masonry material often used in the construction and ornamentation of buildings. Terracotta was first produced around 1400 BC in Mesopotamia and the Indus Valley, when the need arose for more permanent structures than those made of sun-dried brick. In ancient Greece, antefixes and cornices were made of terra cotta. The Greeks then introduced it to the Etruscans, who were the first to use it to create decorative slabs for facing walls. When Rome conquered Etruria, the Romans adopted the use of terra cotta for structural walls, which were then clad with marble. Today it is much in demand, molded into ornamental shapes and different sizes of bricks and tiles as well as other architectural elements. - Allison Eckardt Ledes, "Terra Cotta" in The Magazine Antiques, April 2007. Excerpt. Glazed architectural terra-cotta was significant in the development of important architectural idioms in this country—specifically, the "Chicago School," the High Rise and the Historic or Beaux Arts styles. In fact, glazed architectural terra-cotta is one of the most prevalent masonry building materials found in the urban environment today. Popular between the late 19th century and the 1930s, glazed architectural terra-cotta offered a modular, varied and relatively inexpensive approach to wall and floor construction. It was particularly adaptable to vigorous and rich ornamental detailing. However, with changing vogues in materials and architectural styles and rising production costs, glazed architectural terra-cotta fell into disfavor and disuse by the mid 20th century. Generically, the broadest definition of terra-cotta refers to a high grade of weathered or aged clay which, when mixed with sand or with pulverized fired clay, can be molded and fired at high temperatures to a hardness and compactness not obtainable with brick. Simply put, terra-cotta is an enriched molded clay brick or block. The word terra-cotta is derived from the Latin word terra-cotta—literally, "cooked earth." 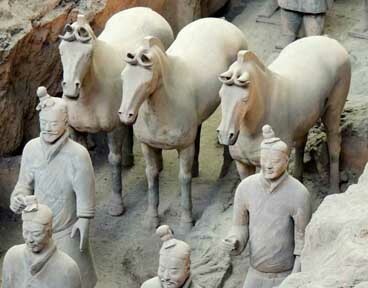 terra-cotta clays vary widely in color according to geography and types, ranging from red and brown to white. In 1895, a a major stone window cap took two men up to six months to carve and cost $1,700, while the stone capital of a pilaster required one man ten months to carve and cost $1,500. Rafael Guastavino was a Spanish architect, engineer and builder who is most famous for the architectural terra cotta tile vault and arch system that he designed and constructed in the late 1800s. Patented in the United States in 1885, the Guastavino tile system uses layers of terra cotta tiles set in a herringbone pattern in Portland cement. Boston Valley Terra Cotta is proud to carry on the legacy of Raphael Guastavino and his vault system. This ancient technology still has a place in today’s arch and vault architecture. Terra cotta panels used for exterior facing of buildings are referred to as ceramic veneer. This veneer is often plain and flat but the plasticity of the material also allows sculptured surfaces. The decorative terra cotta used for copings, column capitals, bandings, gargoyles, and other ornamentation is referred to as architectural terra cotta. The qualities that made terra cotta such a widely used building material a century ago make it an attractive and cost effective option today. Terra cotta offers extraordinary plasticity that achieves a richness of surface texture and finish detail. Architectural terra cotta can be used for parapet copings, decorative moldings, color accents, sculptured borders around door and window openings, dedication plaques, medallions, identification logos, and building signage. Ceramic veneer panels provide a durable, low maintenance, weathertight, attractive building cladding and an alternative to glazed concrete block or ceramic tile facings. The application of terra cotta on contemporary buildings is an ever increasing use of an old product that has stood the test of time. Ceramic veneer panels are typically extruded, flat panels with ribs or scoring on backside. Ornamental shapes are typically produced by pressing plastic clay into molds resulting in a hollow form with an exposed front wall strengthened by perpendicular partitions and top and bottom beds. Terra cotta pieces can be left unglazed or finished with a mixture of metallic oxides, chemicals, clays, and water sprayed on piece which is then fired to fuse the ceramic finish to the terra cotta body. Glazes may be high-fired type which are sprayed on pieces prior to firing. Low-fired glazes are applied to pieces that have already been fired. These pieces are then fired again at a lower temperature to fuse the ceramic finish to the terra cotta piece. Matte, satin, and gloss finishes are available for glazes. Either a single color or multiple colors can be applied to a terra cotta piece. A mottled appearance can be achieved by blending two or more colors during application. Mortar is made up of cement, lime, and sand. Mortar color can be achieved by using colored sand or mineral oxide pigments.